Julius Caesar (100-44 BC), the famous Roman general, statesman and dictator who was murdered on the Ides of March, was also, less famously, an author. He wrote several sets of notes ('commentaries') on the civil war and on wars in Gaul (present day France) in the guise of unbiased factual records, but really as attempts to justify his own actions. Several other accounts of wars commonly attributed to him (some of which are in the present manuscript) were actually written by members of his staff. This manuscript, written in Florence, can be identified in a catalogue of Lincoln College, Oxford, dated 1474. 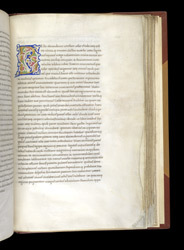 Two lines have been left blank at the top of this page for a rubric above the initial 'B', which suggests that the scribe wrote the main text first, and added the rubrics later. In this case he either forgot, or did not have the correct wording available.